The veteran surfer Hanzo is amped for an epic run. Shasta, is hoping to avoid eating it on any gnarly waves. These are just two of the veteran surfers that took to the waves this past Sunday to hang 20 for the 7th annual “Surf City Surf Dog” surfing competition at Huntington Dog Beach, just outside of Los Angeles, California. That's right, forget your surfing bird, forget your surfing safari, these are surfing dogs, hitting the long board hoping for the perfect wave, with a little help from their owners. Some surfed perfectly, moving forward on their boards, or going backward. There were wipeouts, and collisions, but for most of the competitors, it was all fun and play. Boxer Hanzo, a veteran in his seventh season competing, was a crowd favorite. "That was a really fun, fun ride today," said Eric Felland, Hanzo's owner. "Really exciting to see the crowd get behind Hanzo." The dogs competed in four weight-class divisions and were judged on a variety of skills, including the length of their ride and their confidence on the board. Shasta, a Shar Pei/Husky mix, was competing for the third time. "Well I can tell from her because she just loves doing just about anything," said Cathy Lawrence, Shasta's owner. "Some dogs you can tell, they're tense and they jump off immediately or they just don't want to get back on the board," she said, "but you can tell if they turn right around and go back on the board, they're enjoying themselves or they're comfortable with it." There are two important requirements for dog surfing, according to James Wall, who owns Faith, an American Pitbull Terrier. 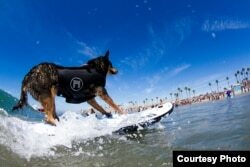 "First the dog has to love the water, that's one of the biggest things, and then balance," he said. "There's various ways you can train the dog on balance. What we did was we took her to the bay area where it's calm water, put her on a board, got her used to the balance and slowly progressed into waves. And here she is now." 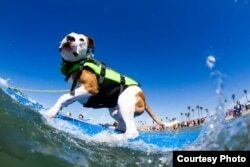 Rookie surfer Copper, a Pitbull/American Bulldog mix, won a "participation" medal. "This is his first competition, but he really likes it," said his owner John Daly, "so we're hoping just to kind of learn and keep coming." When it was all over, some trotted off the beach with medals. But in the eyes of their owners, all of the canine competitors were winners.